Welcome to the first part of our three-part series on slope stability! Part 1 defines slope stability and its mechanics, influencing factors, and associated features, and also plants seeds of awareness you can harvest for upcoming projects. Part 2 will provide guidelines for qualifying the risk of slope failure, identifying the geotechnical items you’ll need on your project checklist, responding to failure events and preventing future failures. Part 3 will outline the geotechnical elements of preventative and response-based slope stability evaluations. 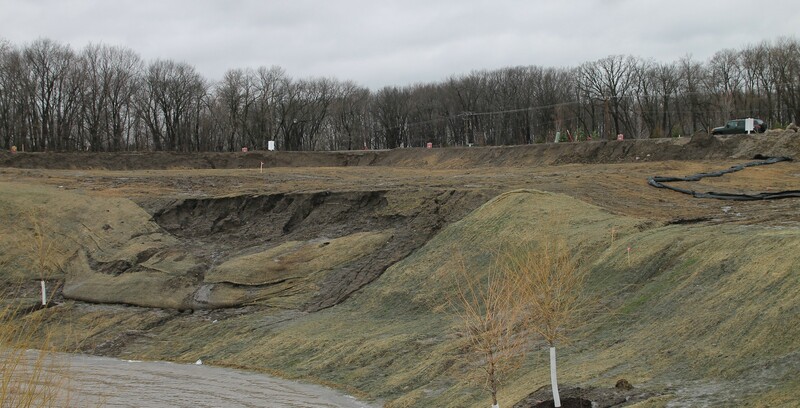 “Slope stability” can be part of a project (embankment on soft ground, temporary excavation) or be the project (storm-induced erosion, wall failure). The former task is preventative in nature and often considered a necessary evil – tight project budgets and schedules have little room for technically intensive tasks that weren’t on anyone’s radar to begin with. The latter task (slope stability as the project) is response-based, and is sometimes authorized without knowing the full cost in order to immediately assess damage and interim risk to the public. Are the two situations different? You bet! First, it costs a lot more to repair a failure than it does to evaluate and prevent it in advance. Second, and more importantly, some failures occur only because those involved were unaware of or didn’t consider the impact of their project on the site, or vice versa. Slope failures, like forest fires, can be prevented! Slope stability is about stress and strength. Gravity and other factors combine to produce a “driving force” potentially capable of mobilizing a failure mass. Shear strength within the soil and/or rock mass provides a “resisting force” to help keep it in place. One way we qualify slope stability is the Factor of Safety, defined as the ratio of the resisting force to the driving force. The Factor of Safety tells us, on a percentage basis, how much greater the resisting force is, or is likely to be, than the driving force. When the Factor of Safety approaches 1, the resisting and driving forces are balanced, and failure is assumed imminent with only a small reduction in strength or a slight increase in stress. What tips the scale? The Factor of Safety can fall due to an increase in the driving force, a decrease in the resisting force, or a combination of both. “Events” that increase the driving force include load application at the top of the slope (filling, building), load removal at the slope’s toe (excavation, erosion), and seepage through the slope. “Events” that decrease the resisting force include shear strength reduction (weathering, softening), and confining stress reduction (saturation, submergence). In a large number of cases, water —whether “sourced” overland or underground —proves to be a critical factor. 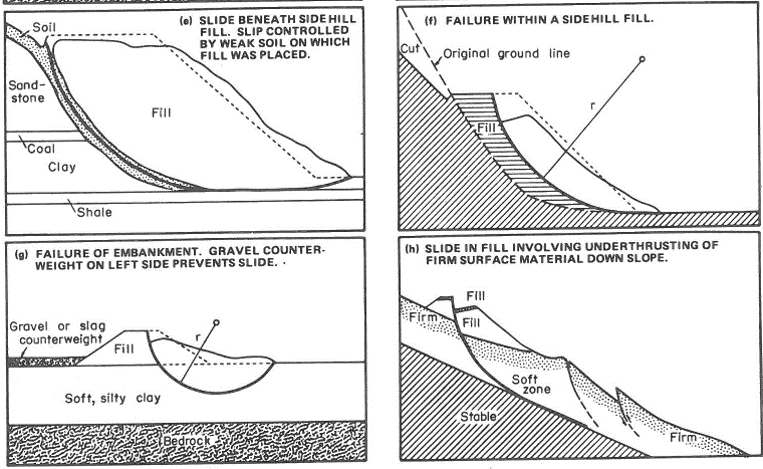 Many of the factors conspiring to fail a slope are naturally occurring, and include slope geometry, soil or rock strength, permeability and layering, surface drainage characteristics and groundwater dynamics. 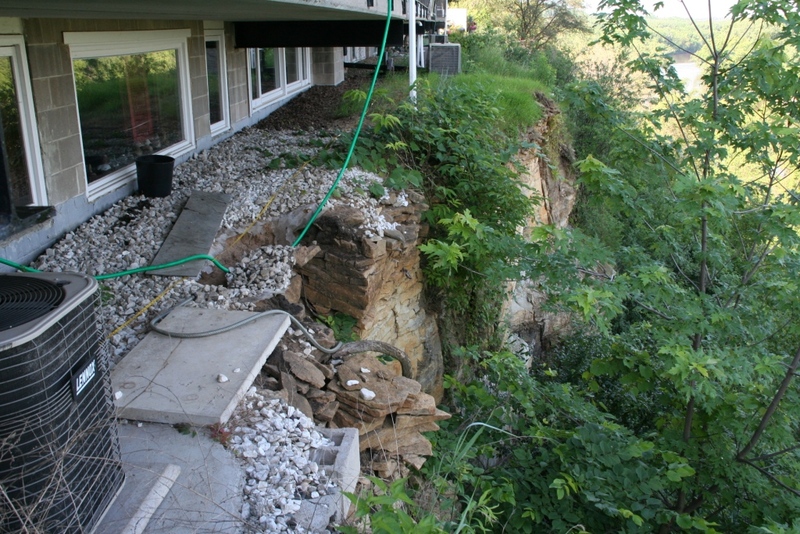 Unfortunately, people can also contribute to slope failure by: cutting and filling their way to more severe geometries, changing local drainage conditions, and conducting experiments to determine how close one can build a structure to a bluff or placing sump hose discharge too close to a retaining wall. Saboteurs aside, you’ll find that susceptibility to failure, and the types of failures that occur will be relatively consistent within the physiographic region surrounding your sites. Building along the Minnesota River Valley? Don’t encourage down-cutting of the massive ravines in the area by casually grading adjacent lots to drain into them. Got an oil pad in the North Dakota Badlands? Bench your fill and drain the sandstone and lignite layers plugged by that fill. Swamp crossing in Bayou Vista, Louisiana? Please reinforce that embankment. Keep in mind, too, that susceptibility to failure may be influenced by conditions extending or present beyond project or property boundaries. Failing to consider “far field” conditions potentially exposes your project, or structures and properties in the shadow of your project, to unnecessary risks. Most slope failures are recognizable by the fresh scars or healed wounds they leave behind. The ground around the upper failure limits generally drops and sometimes moves laterally, leaving a steep scarp and parallel rows of tension cracks. The lower failure limits may exhibit bulging or spreading, also subject to cracking. Overall, grades are non-uniform or abrupt, trees may lean or bow, and water seeps from multiple sources throughout. With time, the scars erode and weather, and new vegetation emerges, rendering these features more subtle and less visible; movement may persist, however, along with cracking and seepage. One can’t assume that the visible failure limits are absolute either. Failure masses are not like cheese wedges that rotate and slide as a single mass; the ground that surrounds them, which at any moment might appear sound and undisturbed, is not to be trusted. Many larger slope failures are actually “systems” of smaller failures that mobilized at different times in the past, gradually advancing the failure limits farther along and up the slope. Cut slopes can be particularly problematic. 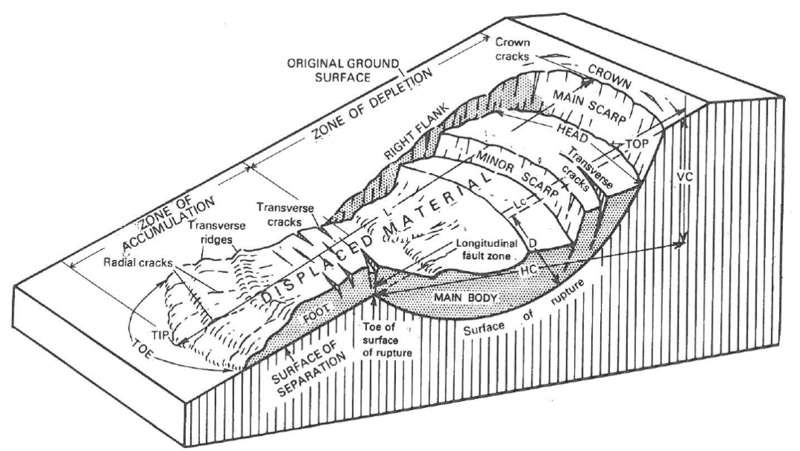 Materials that were once confined must now “stand” at steeper gradients or greater heights; sloping strata, once concealed, now become potential sliding surfaces dipping out of the slope. From a stability standpoint, “slopes” also include timber walls, block walls and piled walls whose elements contribute to the balance – or imbalance – of driving and resisting forces. Even slopes comprised of robust materials still experience erosion from uncontrolled or concentrated drainage that can result in the loss of vegetation at the least, and down-cutting or slumping if left unattended. Finally, no slope is immune to failure due to unforeseen subsurface conditions or extreme storms, for example. Building a knowledge base beginning with the principles of slope stability will give you the foresight to prevent failures long before, in the planning and design stages of your projects, they would otherwise occur. That knowledge, however, is driven by an understanding of local terrain, geology and failure patterns, and leveraged by a broadened awareness of our vulnerability: Development occurs quickly relative to geologic time, and the factors influencing slope stability long preceded us; geotechnical concerns may also be low on planning agendas, yet the risks lie in wait.